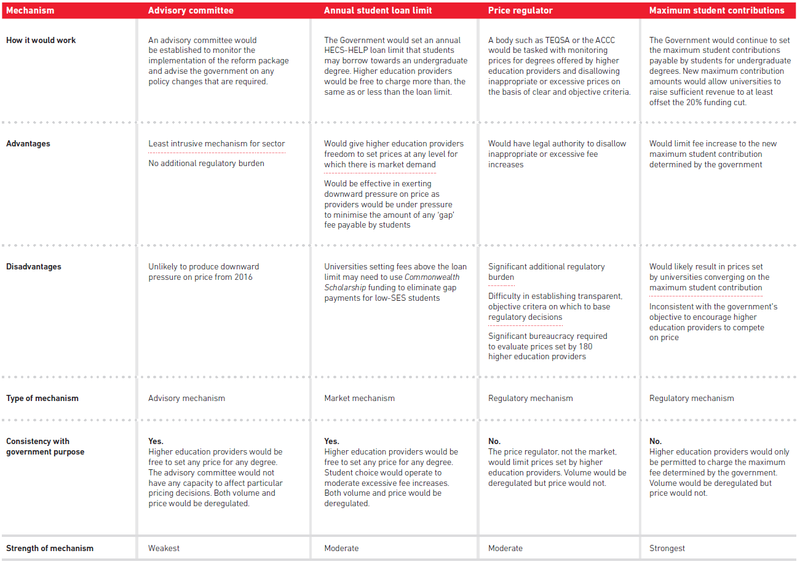 As the cross bench senators weigh up the government’s higher education reform package, including university fee deregulation and student loan interest rates, they might well consider a comparison table released by Swinburne University of Technology to assist in the evaluation of four policy options that have been canvassed to moderate against excessive student fee increases from 2016. Experts have predicted that the price of degrees will increase significantly from 2016. The proposed flat fee of $16,000 per year announced by the University of Western Australia for 2016 represents an increase over 2014 prices, ranging from +56% (Bachelor of Commerce) to +166% (Bachelor of Arts). Any price rises from 2016 are likely to be compounded by the operation of the HELP scheme, which ensures that price signals are weak for consumers at the time of purchase. There will be no upper limit on the amounts that students can borrow either for undergraduate or postgraduate degrees from 2016. A number of mechanisms have been proposed to moderate likely fee increases from 2016. Swinburne University of Technology has proposed an annual student loan limit (a ‘soft cap’) as one means of exerting downward pressure on price from 2016. Other options that have been canvassed include an advisory committee, a pricing regulator and the establishment of new maximum student contributions for higher education (a ‘hard cap’). This resource presents how each of these four policy options would work and how strongly each would operate to produce downward pressure on prices set by higher education providers from 2016.